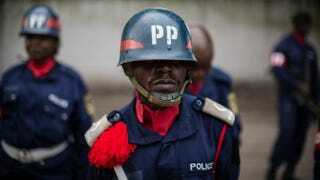 Congolese police wait to take part in a ceremony on March 3, 2015, in Kinshasa. A U.S. diplomat is one of several people who were detained Sunday during a raid by security forces in the Democratic Republic of Congo, the Associated Press reports. The raid targeted journalists and pro-democracy activists thought to be agitating the Congolese government by “posting a threat to stability,” a DRC government spokesman said. The diplomat “was found among a group of people that was believed to be in the process of bringing an attack against state security,” said Lambert Mende, the DRC’s minister of communications. The U.S. Embassy in the capital, Kinshasa, did not respond to inquiries from the AP; nor did the U.S. State Department give information about the identity of the detained U.S. diplomat. No information was available about whether the diplomat was released. The detentions came after a news conference that promoted the efforts of a movement that is trying to get youths in the DRC more involved in politics. Mende said that the members of the detained group were being questioned by authorities. He said that foreign journalists in the group had been released, but did not comment on whether foreign diplomats, local journalists or local activists had been freed.